Lake Nona is located about 25 minutes south of Downtown Orlando, just east of the Orlando International Airport. What was once desolate farmland, Lake Nona is now considered one of Orlando's hottest real estate markets. Radiating east and west from Narcoossee Road, the area is alive with new infrastructure, commercial development, single-family homebuilders and new luxury apartment communities. Lake Nona is a fast-growing community full of new construction and an unbeatable location. With this area being only a short drive from the allure of both Downtown Orlando and the theme parks this region is known for, many people are opting to call Lake Nona and Narcoossee home sweet home. Lake Nona Village, Nona Blue Modern Tavern and Nemours Children's Hospital. ROOM FOR GROWTH & RECREATION! Although the Lake Nona and Narcoossee area is full of newly developed communities and businesses, there are still many recreational opportunities available for nature and sports enthusiasts. Moss Park is located off of Narcoossee Road and offers camping, water sports, BBQ areas, playgrounds and pretty much anything you could ever dream for in a park! This area also boasts numerous centers for outdoor activities, including Laureate Park's Aquatic Center. The Northlake Park Community Center and YMCA Family Center have been touted as one of the best in the area, with programs for families, children and fitness buffs. If you like to hit the greens on the weekends, you'll want to check out the beautiful Lake Nona Golf & Country Club. There are also plenty of community parks, baseball fields, soccer fields, tennis courts, tracks, picnic areas and dog parks in the Lake Nona area. LOCAL OR TOURIST? YOU DECIDE! The best part about living in Lake Nona and Narcoossee is your abundance of choices when deciding how you would like to spend your free time! If you would like to live like a local, you can check out a variety of community events, including Taste of Nona, an annual fall event at the Lake Nona Town Center featuring local restaurants and live music. For history buffs, there is a Civil War reenactment each year called the Battle at Narcoossee Mill. If you want to live the life of a tourist, this area is within a 25 minute drive to all of the major theme parks, including Sea World, Universal Studios and the most magical place on earth! There are brand new restaurants and businesses popping up every week in the Lake Nona and Narcoossee area with rave reviews from the surrounding communities. Lake Nona Village is a shopping center that includes a handful of local eateries, shops and condominiums. Nona Blue Modern Tavern is owned by professional golfer Graeme McDowell and is known for their delicious steaks, seafood and Irish fare. The Lake Nona Deli & Market is a delicatessen, pizzeria and local food market frequented by residents in the area. Nona Sushi is a popular spot for a quick lunch or a dinner date. Sweet Mama's is a local eatery serving up comfort food just like your grandma used to make. With numerous chain restaurants such as Tijuana Flats and Outback Steakhouse, Lake Nona and Narcoossee is sure to have a place that satisfies everyone's appetite. There are a number of award-winning schools serving the apartments in Lake Nona and Narcoossee area. Children in grades K-5 are zoned for NorthLake Park Elementary, Moss Park Elementary and Eagle Creek Elementary. Middle school students are zoned for Lake Nona Middle. High schools students are zoned for Lake Nona High. Colleges and post-secondary schools in the area include Valencia College, UCF College of Medicine, UF Research & Academic Center and Florida Institute of Technology. The Lake Nona Town Center is this area's shopping hub; it features everything from restaurants, to boutiques, to doctors' offices…even an up-scale hotel! While this shopping center is continually growing and adding on additional phases, residents can rest assure there will be no shortage of boutiques or local shops to satisfy their shopping habits. Larger malls that are within a short driving distance include the Florida Mall and the Waterford Lakes Town Center. If thrifty is your style, you will want to check out the best that the Orlando Premium Outlets have to offer. For a more unique shopping experience, the Artegon Marketplace prides itself as the "anti-mall." Driving a significant amount of this growth is the Lake Nona Medical City, a rapidly developing biomedical research and education park. The area houses the Orlando VA Medical Center, Nemours Children's Hospital, Sanford-Burnham Medical Research Institute, and a University of Florida research and academic center. The Lake Nona Medical City is also home to the University of Central Florida College of Medicine and Health Sciences Campus, which includes the College of Medicine and the Burnett School of Biomedical Sciences. As the Lake Nona Medical City expands to include UCF's College of Nursing and the College of Dental Medicine, more will be moving into the area to take advantage of the wealth of job opportunities and resources. Narcoossee is slightly further south. While the area is still relatively sparse compared to its neighbor to the north, it is the natural community to absorb Lake Nona's unceasing growth. Lake Nona and Narcoossee are out of the hustle and bustle of the busy downtown Orlando area, but is still convenient enough to most major areas that commuting is not a problem. State Road 417, also known as the Central Florida GreeneWay is a toll road that begins in north Orlando and runs down the east side of all the way until it interchanges with I-4 near Celebration. This option runs right through the area. Narcoossee Road (CR 15) is the major thoroughfare in the area, which includes access to the majority of restaurants and shops. 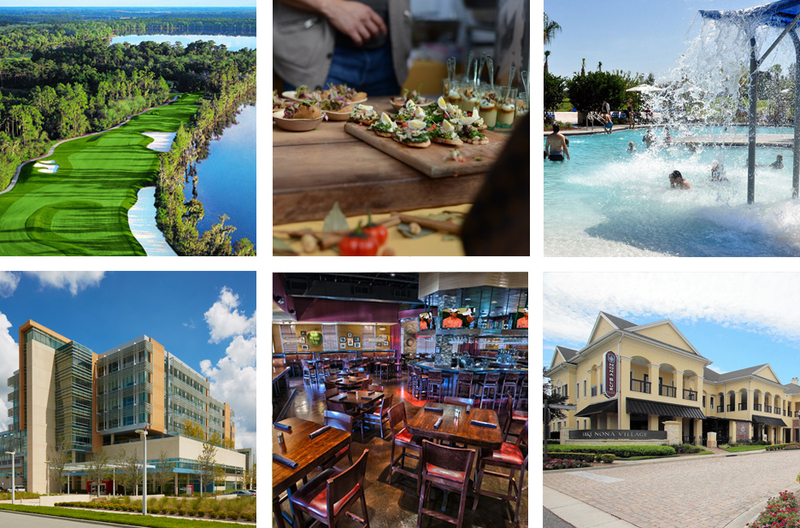 (Photo credits, clockwise from top left) Lake Nona Golf & Country Club, Lake Nona Social, LakeNona.com, Orlando Sentinel, Nona Blue Modern Tavern & Lake Nona Institute.